Watch this video to see unstructured play at The Grove in action! Leave the electronics at home. The Grove Nature Playscape is a place where kids can use their imaginations to explore natural materials in a playful way. This certified Nature Explore playground has a few different areas to dig into that highlight different kinds of play and learning. The Tone Zone provides opportunities for creating sounds using a variety of different instruments. At The Block Lab kids can build with wooden blocks and tree cookies. The building possibilities are endless!! The Spiders Web is a great place for kids to climb, play and use their imaginations. You would be surprised by the games they come up with!! The Inspiration Tree is the fallen log that started it all. This tree was just off of the parking lot and kids would naturally gravitate to it and start climbing. This was the beginning of The Grove! The Leopold Shack was designed as a covered hang-out spot for kids to be creative. There are shelves for kids to display found objects and create their own cabinet of curiosity. The Art Pod has slate easels for kids to paint with water from the cistern attached to Leopold's Shack. A sand table entices kids to experiment, and a large table provides plenty of space for creating. 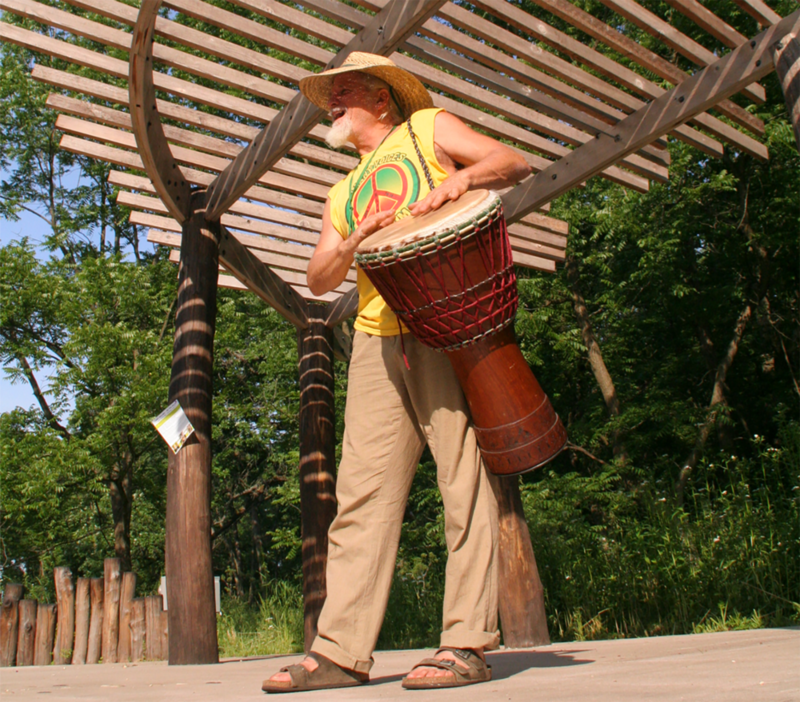 Musician David Stocker performs at the grove’s bandshell. Artist Drew Helge demonstrates working with clay at the grove.